The Knowledge Capture® Sports Social Media Management module enables organisations to manage the content being posted by high profile sports stars across social media. All publically available content that is posted by monitored players is captured, analysed and displayed via drillable dashboards. 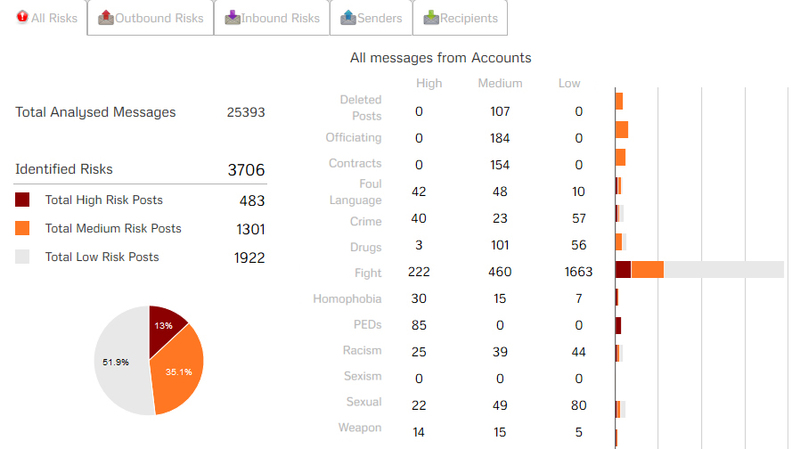 These dashboards display the classification of the messages and includes analytics to understand posts containing inappropriate information. If a message has been posted publically and then deleted by a player, the KC social media module captures this data, along with any replies to the post. Within the solution this message will be flagged up for review in order to check for content that should not have been posted in the first place. Often high profile stars have access to social media directly after participating in sports and often tempers can be running high, leading to content being posted and being removed once reviewed at a later time. Major sports leagues often have regulations baring players discussing officiating and contractual information on social media. Due to the following most of these players have across social media, messages posted regarding officials of the games will often get a large amount of negative content posted back. Due to the numbers of followers, inappropriate content will also go viral very quickly, which will often result in social media scandals, negative publicity for the player but also the league they are apart of. All messages that are captured via the KC social media module run analysed via comprehensive content analytics. These analytics are powered by lexicons behind the scenes that can identify and classify the content of the message based on a wide range of issues. Out the box, the KC social media module can classify data based on foul language, contracts, crime, racism, sexism, drugs and many more. Each of these classifications can also be prioritised as either high, medium or low and with this auto actions can take place in order to alert the league about content being posted. Content is captured and placed within a single inbox, no matter the social media channel the content is posted from. Within a central inbox, messages can be filtered down via social network, player or subject, whether the content is inbound or outbound, risk priority, categorisation or date range. Filters can also be saved for speed of use and bring efficiency to the business when searching for common themes. When combined with advanced search capabilities, users can search for keywords and phrases across all social media data that has been captured.